New owner, couple pics couple questions! Bought my first VTR about 2 weeks ago, been getting used to the liter life. 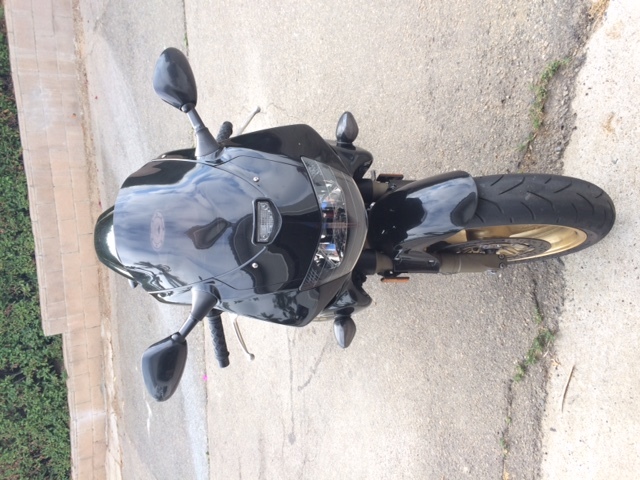 Came from a Kawak 250R that I bought to commute on while my car was in the shop (carpool lane!! ). 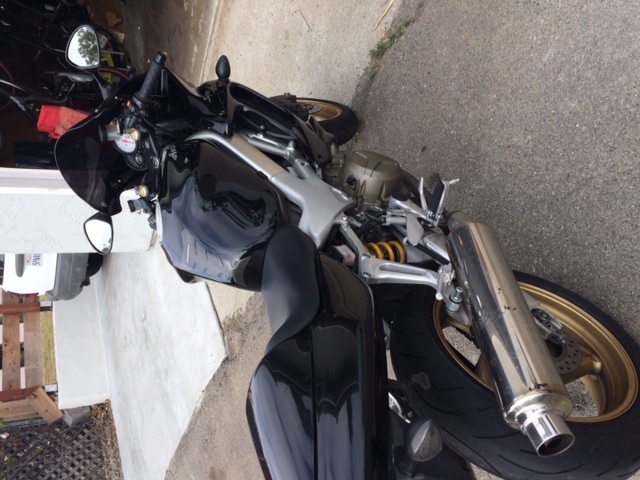 I loved my little 250 and thought it was all I needed, but after getting over the learning curve, I felt like more power would serve me well in an 80 mph commuter setting. The little kawak really struggles past 70, and the inability to get out of a situation haunted me everytime I got on the bike. So, went looking for a cheap/deal on a 650/750/1000. 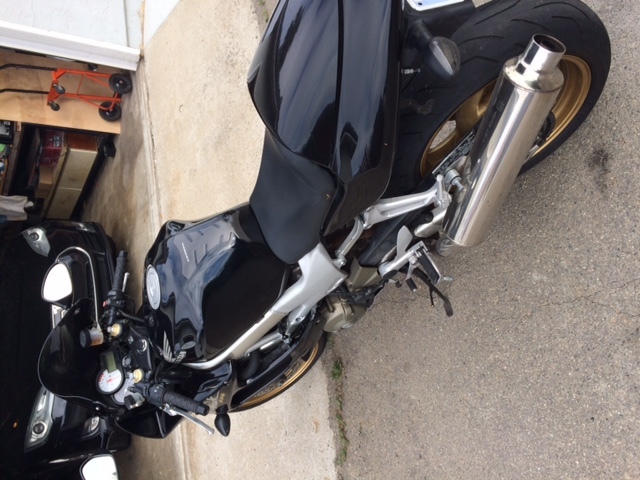 I tried to stay away from the 1000cc area, but I got a great deal from a nice guy on a VTR with 19k miles on it; fresh brakes and new chain with receipts. It's never had the valves done, so that will come up here soon, and needed new tires... so it was priced to move. I bought a pair of Bridgestone s20 take-offs from a R6 and took it to my local shop to have them mounted etc. My mechanic says the bike is good, except he thinks the head bearing is showing early signs of wear. And of course through my own research here, I'll be picking up some Krieger CCT's soon (my kawak's CCT was a little wonky, but you clean them and grease them up and they work great). 1.) Sargent seats are discontinued, am I SOL? Am I buying here/from other riders if one ever pops up, or are there other seats folks recommend? 2.) My bike does this thing at low throttle (not rpm, but most noticable at low rpm/speed) that I could only describe as tugging from the rear wheel. Feels like I'm towing a trailer that's bouncing on the ball hitch if that makes sense? There's no odd sounds so I don't think its "lugging" as I've read the description from others... After doing some digging I feel like it could be related to the TPS sensor, but most of the threads and DIY videos skip the steps about how to measure resistance, and how to do the adjustment without removing it (can you? if its not SUPER far out of whack?). Thoughts? 3.) Finally, moving up from a 250 to a liter bike has had its challenging moments, most specifically in low speed handling and offramp/onramp stuff. I feel like I shouldn't leave the bike in 1st gear/4k~ rpms during these low speed maneuvers (since its a hefty vtwin and not a screamer like my 250), but 2nd gear is just not enough. I know the answer is "go faster", but my question is more "am I doing it wrong" by sitting around the 4k rpm mark for these things, regardless of gear? 4.) Finally, if there are any recommended mechanics in the North county san diego area, or any diy wrenchers I can buy beer/pay to watch do some of these more sensitive repairs and mods... hit me up! I have a lot of experience with boats and cars, but bikes seem so much more sensitive and the consequence for failure is.... bad. 1) Your best options are used Sargents and Corbins that occasionally come up here. 2) carb sync & TPS adjust are well explained threads in the Knowledgebase section, also a full PDF of the shop manual is there. Best to drill the blind bolts from the TPS sensor to adjust. 3) 4K is not a bad place to be on a big twin. Chugging along at less than 3k is not recommended. 4) Don't know but chances are there's a forum member near you. Good luck, hope you enjoy the SuperHawk! It's been a while since I reset my TPS but I recall that it was possible on the bike once the airbox was pulled off the carbs. Not sure that this would reduce your surging at low revs but it can't hurt. IIRC correctly resetting the TPS involved loosening the retaining screws and rotating the TPS body slightly, then re-tightening the screws. If you are that far in to the bike, why not pull the carbs out and give the bowls and jets a clean, could be that your low speed jet(s) are a little clogged. Honda set the redline at 9500 rpm for a good reason, feel free to use all of that. Around town I generally shift up around 4000, my bike runs really happily at lower revs but I don't like to lug the engine. Don't ever assume "just ride faster" is a good solution; ride at a pace you feel comfortable at, and change gear to keep the engine happy. There's plenty of time to go faster when you've got more experience on board. Sargent, within the last year or two anyway, has a service where you send them your seat, a bunch of $$$s, and they send you back one of their seats on your old base. Give them a call to verify. Nice Hawk & welcome to the asylum.....er, forum. Thanks guys, I definitely plan to clean the carbs when i go to do the CCT. Is it really so loose or delicate that it will hop teeth just by removing the tensioner and putting another one in? I think the answer lies in the fact that there are two CCT's but each only controls one set of valves. On a parallel twin or inline 4 the valves will tend to oppose each other and prevent the cam from spinning/jumping against the loose chain. Don't be surprised if you can't get the cam timing marks to line up perfectly with the head surface when the crank is in the correct position. I think these chains stretch a little with use, my timing was off by about half a tooth, so clearly not one or more teeth out, but not exactly right either. Seat: I have a Corbin. I love it. Seems people love them, or hate them. Last time I looked (2 weeks ago?) there was one on eBay for $175 plus shipping (it has a red welt), I think. (New, they're over 400). The rap against them is they're 'hard'. I don't notice mine riding 20 miles. The stock seat became unbearable in the same distance. Tugging at back wheel: Is it running lean? Too much air not enough fuel (or not enough fuel too much air). This is particularly noticeable at low speeds where the bike will surge. This is not a recommendation. Just info. Last edited by AlanS; 08-09-2017 at 07:13 PM. Quick Reply: New owner, couple pics couple questions!